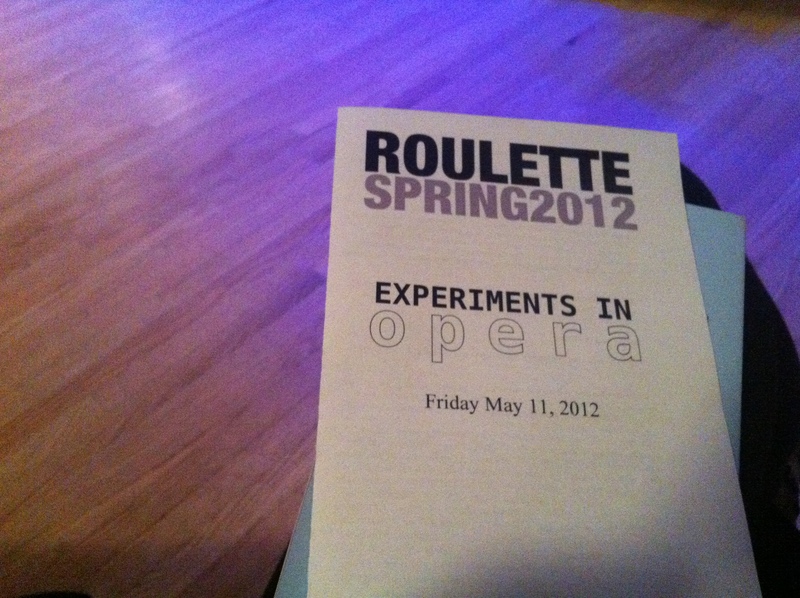 I’ve reviewed portions of Matthew Welch’s opera Borges and the Other twice before (here and here), and back in May I had the pleasure of seeing the recently finished product at the new Roulette in Brooklyn, presented by Experiments in Opera (of which Matthew is a founding member). The piece was performed by the ever-solid Blarvuster and new music star vocalists Jeffrey Gavett, James Rogers, Lisa Komara, and Amirtha Kidambi. Both acts of the opera draw from Jorge Luis Borges’ short story The Other, about a meeting between an older Borges and a younger Borges. Act 1 featured the two male singers, dressed in suits and sitting on stacks of books, acting out the parts of Borges at 19 and Borges at 70, accompanied by music that alternately evoked the watery scene of their meeting (the Charles river for the older Borges, the Rhone for the younger), and the dreamlike, fantasy state that both characters assumed must be the cause of such a remarkable meeting. In between Acts, the newest addition to the opera appeared, in the form of a 4-person chorus, who (a la the chorus of an ancient Greek tragedy) commented on the proceedings in dramatic clustery chords. Act 2, this time featuring Amirtha and Lisa as the two Borges, also both dressed in suits, set a more fervent tone with its rapidly rising and falling pentatonic scales, reflected in the lighting change to bright yellow from the deep blue of Act 1. The opera ended with Blarvuster’s characteristic modular, whirling melodies, sounding akin to bagpipe music (see Blind Piper’s Obstinacy #2).